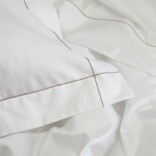 Tremiti is made from a lusterous Egyptian cotton in a 600 thread count sateen. It is perfect for those seeking the luxury and smooth touch of a true sateen. The design comes with a timeless chain stitch detailing perfect for all bedroom decors. The collection launders perfectly becoming softer with every wash. Note: Sheet set includes a fitted sheet, a flat sheet and two standard pillows.